Simplify workflow and gain diagnostic confidence with this resting ECG for physicians offices, medium-sized clinics and community hospitals. The MAC 1600 Resting ECG System is particularly suited for physicians in offices, clinics and community hospitals. The MAC 1600 system can be easily configured to meet the needs of nearly every practice. With quick assessment of the ECG signal quality, the availability of the GE Marquette 12SL ECG Analysis Program, and an easy connection to GE CS and MUSE Information Systems, the new MAC 1600 couldnt be smarter. 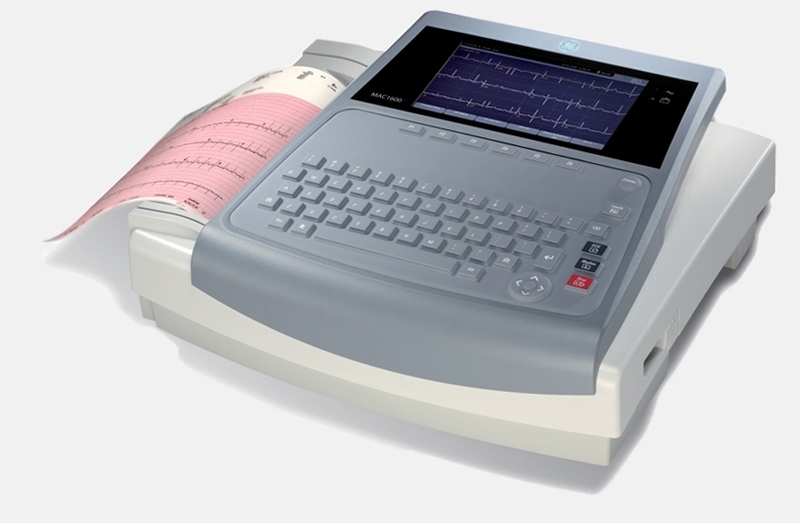 The MAC 1600 is part of GEs legacy of innovation in ECG acquisition and analysis with a modern system designed with input from users around the world. Diagnostic confidence: Recognized across the globe as one of the most validated programs in the industry, the optional GE Marquette 12SL ECG analysis program provides true, computer: interpreted analysis of adult and pediatric populations. Signal quality: The Marquette 12SL Hookup Advisor™ ensures ECG signal quality from the start. This exclusive GE algorithm goes beyond simple electrical checks to advise clinicians of poor waveform quality during the recording of ECGs. Easy configuration: The MAC 1600 automatically captures 10-second ECGs with one-touch operation. Additionally, you can select the rhythm ECG mode to continuously review all 12 leads, or the arrhythmia mode for an extended review of arrhythmias or events. Comprehensive: The MAC 1600 offers more than just acquisition. Its online editing and re-analysis of ECG waveform capabilities enhance the accuracy of patients’ records. Connected and scalable: Not only is the MAC 1600 capable of seamlessly connecting to the MUSE and CardioSoft information systems, it also adapts to your specific needs and can be expanded as those needs grow. Comprehensive training: Easy-to-learn – The computer-based training DVD includes a complete suite of MAC 1600 clinical education tools that make it easy to learn more about the MAC 1600. Click the button below to add the GE MAC 1600 Digital Electrocardiograph to your wish list.